Richard Griot founded Griot’s Garage in 1991 with their first 16-page catalogue, mailed from their Vista, California warehouse. There are many catalogue companies and many car care companies, but what Richard had going for him was a commitment to quality and continuous improvement. Never content with “good enough”, Griot’s Garage develops new products every year that solve a detailing problem, make a detailing task easier or just make cars look better. Since the inception of Griot’s Garage, the company has functioned on two equally important principles. Number one: Provide products and service that enable customers to experience our slogan “Have fun in your garage”. Number two: Create customers for life. Every Griot’s Garage product has a lifetime guarantee. 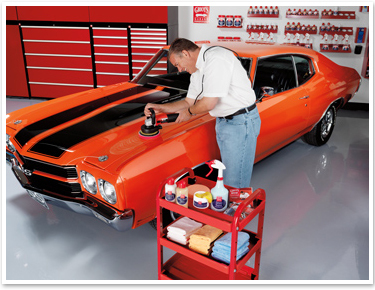 Griot’s Garage used these two principles to become one of the most widely recognized brands of car care in the world.? With a growing demand for Griot’s Garage products, the company headquarters, manufacturing, and warehouse/distribution moved from California to Tacoma, Washington in 1996. The manufacturing and order fulfillment location then relocated to Plainfield, Indiana in 2004, where the land and building are owned exclusively by Griot’s Garage as is all the production and bottling equipment. All formulas are developed in Tacoma and Plainfield and all liquid car care is made in the U.S.A. Griot’s Garage launched its website to complement its handbook in 1999. Today the Griot’s Garage Handbook reaches millions of car care enthusiasts all over the world. It has become a source of valuable information and inspiration for car lovers looking to obtain a beautiful, concours finish. Griot’s Garage has become a staple at car shows. The company sponsors car shows every year and their products were used exclusively to detail the 2008 Pebble Beach Concours d”Elegance Best of Show winner 1938 Alfa Romeo 8C 2900B. Steve Kovach and Rob Wood from Griot’s Garage will be at Autogeek’s 5th Annual Detail Fest this weekend, March 27-28!